Today's a tough day in Philly. 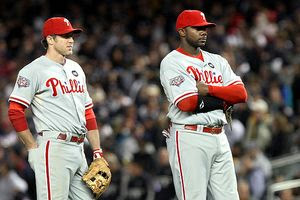 A great Phillies season ended in disappointment at the hands of the New York Yankees in the Bronx last night. It took 371 days and 177 games to do it, but the Yankees dethroned the defending champions of baseball with a 7-3 win in Game 6 of the 2009 World Series. Surely the Phillies team's unsuccessful attempt to defend its championship is a major disappointment to the players and coaches, who have tirelessly worked towards this goal since they hoisted the trophy a year ago. The National League Champions are a marvelous collection of talent congealed by an intangible chemistry and an unwavering focus on repeating last season's feat. Suddenly, the dream ended late last night in Yankee Stadium to another highly talented team congealed by a $208 million payroll. The pain and lack of fulfillment was etched on the faces of the Phillies players who lingered in the dugout to witness the Yankees on field celebration. The disappointment is also deeply felt by Phillies fans, who have invested a great deal in this team. Besides the obvious financial investment made in packing Citizen's Bank Park every night to support the team, the hurt derives more from the tremendous emotional investment that is expended. This a remarkable team and an extraordinary period in Philadelphia sports history. The stakes are raised by fans knowing deep down that this edition of the team presents an unique opportunity that will not always be there. Whether its going to the Bank, watching on TV, listening to sports radio or reading about the team, the Phillies are an important part of its fans' daily lives. The team and its journey are part of water cooler conversations, dinner talk and in the forefront of minds. This won't suddenly end, but the year long euphoria will shift towards the quest to wrest the trophy back, which unfortunately is not quite the same. Although the team fell just short this year, it was still another magical run packed with excitement and thrills. Besides their considerable talents, importantly, the players themselves are tremendously appealing and likable. Things did not break their way in the World Series, which is always part of the equation that makes winning a championship so difficult, but that does not detract from the fact that it was a fabulous season against any standard. As the World Series progressed, I found myself simply feeling that I didn't want it all to end. 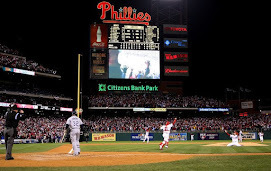 Although the desire to see the Phillies repeat as champions was consuming, I wanted the great adrenaline rush and pure pleasure of the quest to continue. Whether its the sheer enjoyment of watching these players perform at such a high level or the daily anticipation of what's next, the energy and emotion it evokes is relatively infrequent and something to be cherished. That is the very essence and magic of sports. The quest can and does captivate an entire fan base, an entire city. It lifts spirits, puts smiles on faces, creates bonds and puts a skip in people's steps. As a Phillies fan, as a Philadelphian, although melancholy over the loss, I feel extremely fortunate for us to have such a marvelous team that took us to the brink. Although this season did not culminate with a trip down Broad Street to a raucous celebration in Citizen's Bank Park, it sure was a fabulous journey and an immense amount of fun. It is still a season and team worthy of celebration and recognition. 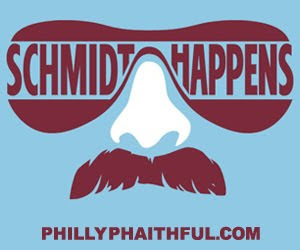 And, the great news for Phillies fans is that there should more to come as the team is currently poised for ongoing success. The sometimes hollow chant of "wait till next year!" rings true, and having come so close this year, another championship will probably be appreciated that much more.